Discussion in 'Classic Menswear' started by jefferyd, Oct 7, 2011. 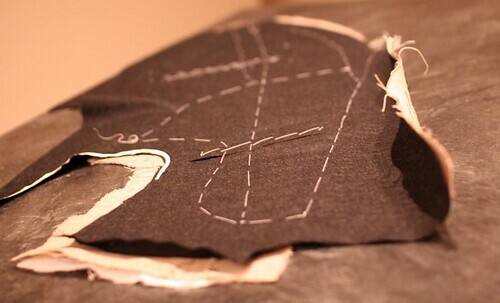 A few years ago I wrote a post about canvas suit construction which some of you may remember. As a continuation of the featured articles on Style Forum I thought I would update and condense some of the information to reflect current trends in manufacturing, and also to bring the information to newer members who may not have seen it. 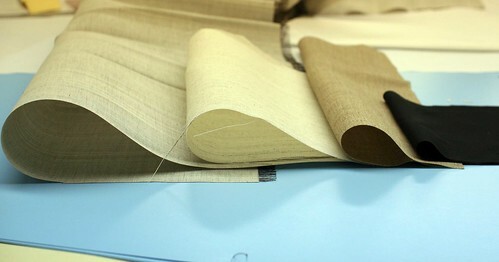 Canvas is typically a blend of wool, often cotton, and animal hair, mainly horse and camel hair. The principal characteristics of the wool and animal hair are that they can be molded using humidity, pressure and heat, and the fibers will retain a shape; think of how a woman uses a hot curling iron to shape her hair. Horse and camel hair have the additional benefits of being lightweight but very resilient- hair from the mane is softer while hair from the tail is quite stiff and wiry. Different types of fiber will be woven in combination with the wool and or cotton to produce various grades of canvas and haircloth which are used in combination to build the foundational structure of a coat. In the photo below, from left to right, are haircloth, which has a lot of roll due to the horse tail strands, wrapped hair cloth which is softer and less expensive than haircloth, wool canvas, and the black item is fusible. Fusible interlinings have come a very long way over the last 40 years. A German company developed the technology whereas an interlining would have a special resin applied to it which, when heated, would melt, and if another piece of cloth was pressed very firmly against it while the resin was soft, a bond was formed and the interlining was fused (or glued) to the cloth. The early days were horrific because the resin which bonded the interlining to the front failed often, causing delamination, or that infamous “bubbling” along the front. 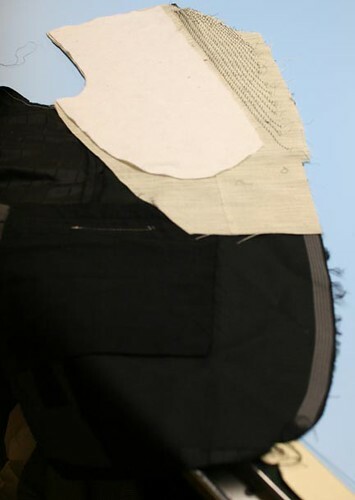 The technology has advanced greatly and these days, delamination is very rare (which is why it’s not considered a problem to skin-fuse a full canvas garment). It can still occur, however, if the garment is improperly handled. Once the interlining has been bonded in a special machine, care is taken to make sure that the area is never heated without simultaneously applying pressure; during construction irons and presses are used, but there is always pressure accompanying the heat. If we want to remove the interlining, however (because of a faulty application, for example), we apply a bit of steam which softens the resin’s bond, and makes it easy to peel the interlining away. Any time you subject your garment to steam without pressure you soften the bond, creating a risk of delamination, which is one of the reasons I warn people never to steam tailored clothing (there are others). While purists will insist that only full canvas garments should ever be considered, there is a significant cost involved and so it is a little disingenuous to insist, particularly to newbs, that fused or half-canvas garments should be avoided outright. Someone who is just starting out his career will likely not have the means for full canvas, nor is he likely to be familiar enough with suiting in general to risk purchasing something off the internet in order to get a good deal. 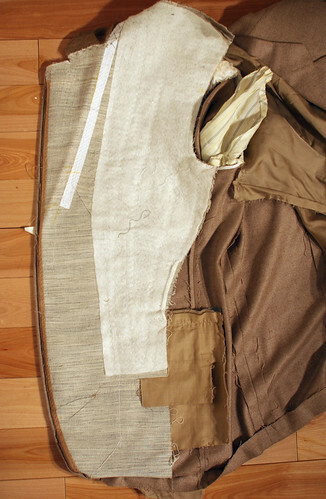 Half-canvas is a more affordable alternative, and if he is really on a budget, a fused garment makes an inexpensive first step; considering how our tastes and preferences evolve once we have been wearing and trying on suits for a while, it is perhaps wise to start off with a less expensive purchase and work up to the better makes once we have a better fix on our tastes and what fits and suits us. This thread will contain information about construction technique but should not reference any particular brands. If you have questions about specific brands please address them in a different thread. What would you say of jackets that have a very nice lapel roll, but are know to use fusible? Could the argument be that this is a cheaper alternative to a fully canvassed garment which seemingly retains the earmark of a fully canvassed one base on the appearance of the lapel (roll)? I believe I read somewhere that this is known as a padded lapel or something. Amirite? Very informative...thanks so much for taking the time to share this information. Great post, and more understandable than anything else I've seen. Thank you! Could the argument be that this is a cheaper alternative to a fully canvassed garment which seemingly retains the earmark of a fully canvassed one base on the appearance of the lapel (roll)? I believe I read somewhere that this is known as a padded lapel or something. Amirite? Great post, thanks. I especially appeciate the fact that you have written it from a neutral perspective acknowledging that there are pro and cons to the different methods. I recently had my tailor make me a completely unlined and unstructured jacket, in a thick heavy wool, that honestly appears to have just as much shape as a fully-canvassed jacket I also have. Is it possible that with darts and enough ironwork, a tailor can add just as much shape to a heavy unstructured fabric than a thin fabric with canvassing? Very interesting. I always found "half canvas" construction confusing, precisely because, as you mentioned, it is so difficult to identify without taking the jacket apart. What are some current makers of half canvas jackets? Someone please buy the stuff I have for sale. I'm looking to clear everything out. Make me an offer. Suit / SC size 56L - 58L EU (44L - 46L US). Some 54L's work. Waist 38 - 39, 40 OK. Shirt 17.5 36/7 optimum, can go 17 and 18 as well. General US size is XL.